Photographed near Olorgasailie, Magadi Rd., Kenya, Africa. Dec. 2014. 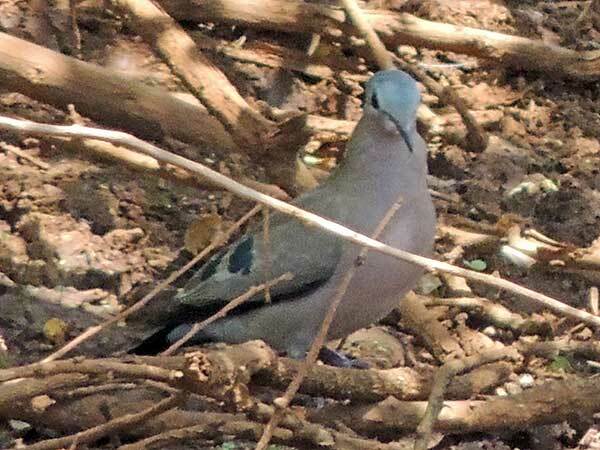 From Wikipedia: Emerald-spotted wood dove is a small plump pigeon, typically 20 cm in length. Its back, hindneck, wings and tail are pale grey brown, and the folded wings have green metallic patches. There are blackish bands on the lower back and tail. The forehead, crown and nape are bluish grey, fading to pinkish grey on the throat. The underparts are mauve-pink, becoming whiter on the belly. The bill of this dove is blackish with a red base. The sexes are similar, but the female may be slightly duller than the male. The immature has duller green spots and buff fringes to the feathers. When flying, black-billed wood dove is told from this species by its bright chestnut underwings. The call is in three parts: two soft long coos, followed by a series of slow descending coos lasting 10 seconds, and concluding with 4 seconds of rapid coos, which decrease in volume.